For many drivers, the check engine light is a very misunderstood feature of their vehicle. The most basic thing to remember is that when the check engine light becomes active, its time for some car maintenance. Phoenix AZ can be a tough place to find quality automotive repair and don’t know what to expect when their service engine light turns on. We feel this is because there is a general lack of knowledge as to exactly how the check engine light works, and what usually turns the check engine light on. The service engine light is connected to the electronic control module (ECM) of the vehicle. The ECM essentially acts as the electrical brain of the engine and some other functions as well. There are multiple sensors throughout the car that feed back information to the ECM and monitor their performance. If the ECM recognizes that something is not up to factory standards, then it will turn the check engine light on. As you can imagine, there are about a thousand things that could cause the engine check light to become active. However, we have compiled a short list of the most common causes why your check engine light is on. Transmission problem – an overheating transmission can easily be the cause why your check engine light is on. Loose gas cap – No kidding! Many vehicles will activate the engine light if your gas cap is not tightened down. Fuel injectors – If your fuel injectors have become too dirty to operate properly; it can often cause problems that will activate your service engine light. Faulty O2 sensor - The oxygen sensor measures the levels of Oxygen in your exhaust. If this sensor has become faulty then its incorrect reading will trigger the check engine light. Many drivers today will simply ignore the check engine light for as long as their car isint making any abnormal noises and continues running. This kind of driving habit may seem like it is saving you money in the short term, but the fact is that you are allowing your vehicle to degrade slowly. This will make for a more expensive repair in the long run. 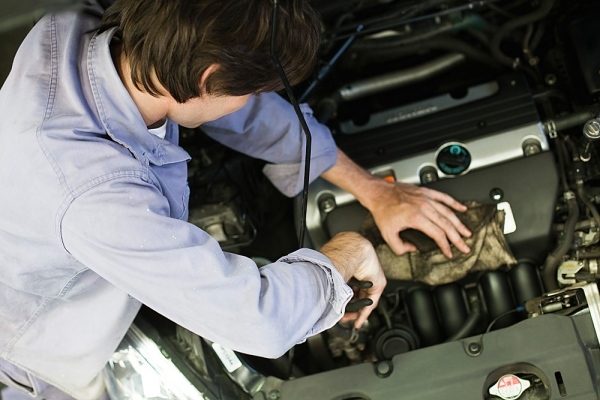 It has been our experience that when people bring their vehicle in immediately after the check engine light turns on, their repairs are considerably cheaper. Just because your check engine line is on doesn’t mean that you have a major repair ahead of you. But driving with your vehicle in this condition could be doing considerable damage to the vehicle. It is a far better thing to discover a minor problem and fix it immediately then allow it to become an expensive repair in the future. Need financing for repairs, or to purchase an alternate vehicle? Mention this offer when you bring your car in.